5 Shows on One Disc! British Columbia Railway. BC Rail was as spectacular an operation to watch as the scenery through which it ran. Sold to the Canadian National Railway in 2004, it"s now a beloved fallen flag of the past, but you can still experience the thrill of BC Rail as it existed in 1986 when this show was originally filmed. Pentrex takes you for a ride along Howe Sound behind Royal Hudson 2860, one of the world"s most beautiful steam locomotives. You"ll also enjoy a trip aboard the Budd passenger cars from North Vancouver to Prince George, a 13-hour journey that takes you into the cab for first-hand views of meets with other trains. Traveling the various subdivisions, you"ll get close-up views of freight operations and will pay a visit the Tumbler Ridge line to see its electric locomotives and their coal loading operations. BC Rail"s color scheme was shifting from green to its new red, white, and blue paint at this time; you"ll see both color schemes traveling through mountains, past lakes, and across bridges. Step back in time with Pentrex to savor BC Rail at its finest! Uncommon Carrier. View the steam, diesel, and electric locomotives used by BC Rail to serve its shipping, passenger, and tourist operations and get special insight into BC Rail"s contribution to the economy of its province. This production includes footage from Pentrex and the BC Rail film library. 995 Days. Experience the Tumbler Ridge Line, the only 50-kilowatt electric railroad in North America. Construction began in 1980 and was completed in 1983, after just 995 days! You"ll see tunnels drilled, track laid, catenary strung, insulators fired, and the unique locomotives designed by GMD of Canada for this remote and fascinating line. Mile 63.5. On a cold November day in 1985, a northbound BC Rail train hit a rockslide at Mile 63.5 and derailed. Experience the efforts of the men and equipment pulling three locomotives up an embankment back to the main line in the middle of a British Columbia winter! Dayliner One and Snowtrain. Enjoy two beautiful travelogs of the BC Rail system. Climb aboard the stainless steel Budd cars, view the beautiful scenery, and visit the towns the railroad serves. Includes great aerial shots of the Budd cars traveling the rails! Jopie (Alberta Canada) on 2013-05-06 17:59:50.
tooster (Queensland Australia) on 2011-10-28 17:14:33. Good train DVD ,had some on old video with same name but this is better . Although I love watching Video Rails DVDs, I decided to buy this Pentrex collection of BC Rail for the sake of enjoyment. To be honest, I wasn't disappointed. Pentrex does a very good job of documenting this railroad. At the time of filming, BC Rail was transitioning into its red, white, and blue paint scheme. Examples are seen infrequently, however, as most locomotives are still seen in the previous two-tone green scheme. Most of the railroad is documented. However, the routes to Fort Nelson, Dawson Creek, and Fort St. James, British Columbia, aren't viewed at all. However, Pentrex's in-depth look at the remainder of the railroad is very enjoyable, nonetheless. The parts that I enjoyed the most are the four productions of BC Rail itself. "Uncommon Carrier" uses Pentrex's footage, as well as some of its own, to showcase its operations. "995 Days" shows the construction of the electrified Tumbler Ridge Subdivision. I especially enjoyed the construction of the locomotives in use on that line. Just look at the circuitry inside those electrics; it's a huge jumble of wires! "Mile 63.5" documents the rescue efforts of the company in its attempt to pull three Alco locomotives back up onto the mainline after having tumbled down the embankment. (Just so you know, their efforts were a success!) And to top it all off, "Dayliner One" and "Snow Train" showcase the routes of BC Rail's passenger train, showing the most important cities along the route. Highlights include: resorts, such as 100 Mile House and Whistler; the rodeo at Williams Lake; heliskiing at Pemberton; a ski race with hundreds of contestants (even the winner is mentioned); and the historic town of Barkerville. This collection is a fantastic one. This one appeals to railfans and families alike. And it's a very good value with over three hours of nonstop adventure. I highly recommend it! I liked the parts "mile 63.5", where they rescue three derailed locomotives from way down the embankment, and "995 days", the construction of a new railway with special 50kV electric locomotives and all. Pentrex takes us on an exciting trip to Canada's mountain province and gives an indepth look at the now fallen flag - BC Rail, before the giant - CNR took over. There are Bud cars in mainline service travelling through the interior of BC to Prince George, Alco's pulling heavy freights through some rugget and fantastic scenery. A steam ride along Howe Sound pulled by the Royal Hudson # 2860. This is some of the most beautiful scenery in all of North America. There is an exciting venture in Northeastern BC at Tumbler Ridge, where London Ontario build Electrics pull heavy coal trains. It's mountains, and see the building of the electric line to serve a remote region of the Nation. 5 movies on one disc. The railfan will truely enjoy this exciting journey. The Tourist will also enjoy the look at the fine scenery and attractions. A bonous is the rescue of some engines that derailed and went down an enbankment. It was hard work, but the engines were pulled up and removed under adverse weather conditions. 3 & 1/2 hours of excitement in a region few of us will ever see. A must for the rail video collector. Ed (Bay Area, CA) on 2011-08-14 18:38:01. 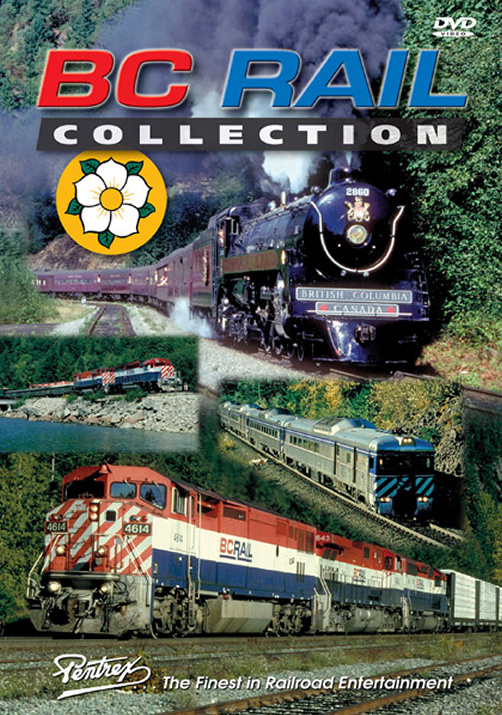 Fantastic scenery, plenty of BC Rail's Alco and MLW motive power working at the head end of long freights, mid-train and rear end helper sets, this DVD covers a large section of BC Rail's route through British Columbia. I was slightly disappointed at the dark footage of the Royal Hudson, seemed like they shot it during midday so it was mostly in shadow. But the extra videos of the construction of Tumbler Ridge and the derailment clean-up operation were very interesting. Well done Pentrex. UK Phil on 2010-03-30 11:48:47. I was very disappointed with this dvd, most of the Royal Hudson steam section I thought was poor as many scenes appeared to have been taken into the sun. I was looking forward into seeing and hearing the Alcos but the filming of these was mostly from above or from very tight angles and very little sound could be heard in these scenes. Most of the dvd was aimed at the tourist information market for British Columbia. Not one of Pentrex's best productions although most of the filming was from other sources. Very glad this was not my first Pentrex purchase as I would have been put off purchasing others by them.